UFC Ultimate Japan program. This program measures approximately 9.5 by 13 inches and has 14 glossy full color pages . Ultimate Japan took place on December 21, 1997 at Yokohama, Japan. This event was also known as UFC 15.5 or UFC-J and was the first of 4 shows the UFC held in Japan. 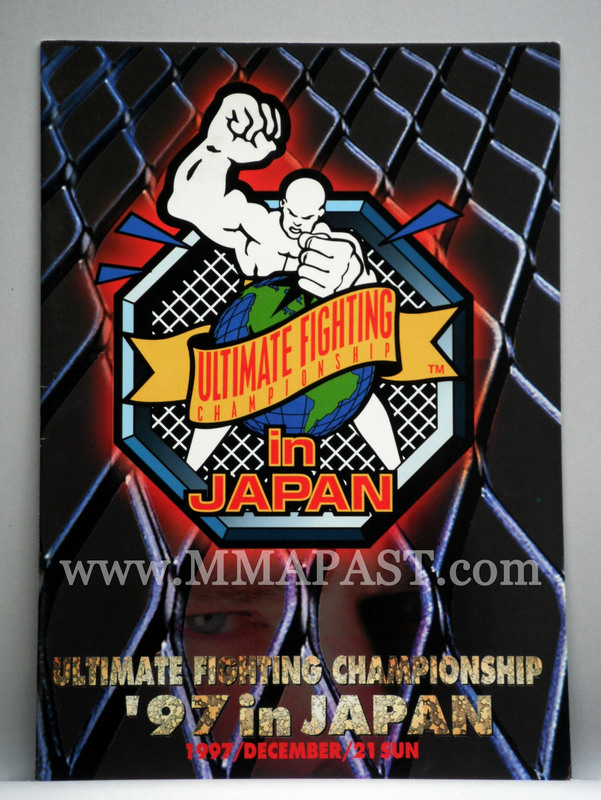 Ultimate japan had 2 championship titles on the line, as well as a heavyweight tourament. Randy Couture beat Maurice Smith to take the heavyweight title. Frank shamrock beat Kevin Jackson to take the middleweight title. Fighting twice, Kazushi Sakuraba won the heavyweight tournament beating ‘connan’ Marcus Silveira in the finals. This entry was posted in Bas Rutten, Carlos Newton, Casino chips, Dan Severn, David Tank Abbott, Don Frye, facebook.com/MMA MUSEUM, Fight worn, Flyer, Frank Shamrock, Goods/Merchandise, Jeremy Couball, Kazushi Sakuraba, Ken Shamrock, Kevin Randleman, Magazine, Mark Coleman, Matt Hughes, MMA, mma collectables, mma memorabilia, MMA MUSEUM, Museum, NHB, Nobuhiko Takada, Pat Miletich, Pride 1, Pride 10, Pride 11, Pride 12, Pride 13, Pride 8, Pride Fighting Championships, pride fighting gloves, pride gloves, Pride Poster, Program, Randy Couture, Rickson Gracie, Royce Gracie, Susumu Nagao, Tito Ortiz, UFC, UFC 1, UFC 10, UFC 11, UFC 12, UFC 13, UFC 16, UFC 18, UFC 2, UFC 23, UFC 24, ufc 25, UFC 26, UFC 27, UFC 28, UFC 29, UFC 3, UFC 38, UFC 4, UFC 40, UFC 45, UFC 48, UFC 5, UFC 6, UFC 7, UFC 8, UFC 9, UFC History, UFC Japan, UFC poster, Ultimate Fighting Championship, Ultimate Ultimate 1995, Ultimate Ultimate 1996, Vale Tudo, Vitor Belfort. Bookmark the permalink.